This has to be in my top 5 favourite soups. It’s substantial, filling, and devilishly tasty. By roasting the veggies first, you add a rich, caramel sweetness to the final taste. This recipe will make a very thick soup, which is perfect for freezing in portion sized amounts as it takes up less room in the freezer. Just add hot water from the kettle when you come to serve/reheat/defrost, until it becomes the consistency you like. Rinse the squash, but don't bother peeling. Slice into 1 inch think slices and remove the seeds. Peel & quarter the onions. Pour a little oil into a large baking dish or tray and add all the veggies and the rosemary, tossing well to coat lightly in oil. Roast for 1 hour or until the vegetables have started to turn golden and feel soft when pierced with a knife. Peel & discard the skin from the squash and the rosemary sprigs, adding everything else to a large pan. Don't worry if there are pieces of rosemary leaves left in. Add the stock or water, and blitz with a stick blender. Taste & season as you like. 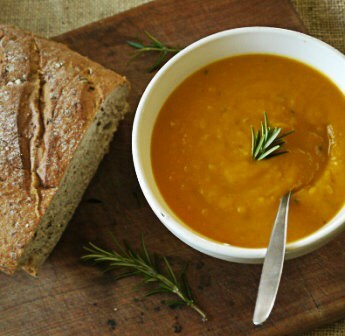 Butternut Soup is a firm winter favourite in South Africa. Two variations are Orange Scented Butternut Soup by adding orange juice and grated orange peel and Curried Butternut Soup. Ooh, orange scented? Sounds interesting Karen! Thanks Tammy! I love them too, but not so keen on the summer squashes. I may try growing some this year to try and make myself like them!